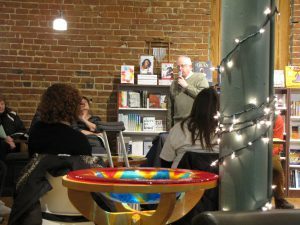 Issue Cafe: Where are we now? Leaders from OTOC, Restoring Dignity and Family Housing Advisory Services led the press conference and challenged the City to come up with a solution. 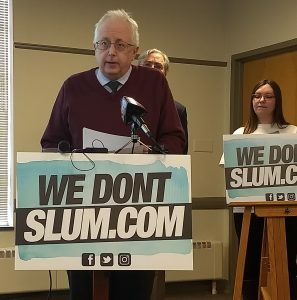 WeDontSlum.com is a tool for tenants to share their stories and pictures of rental conditions across Omaha. If you or someone you know has slum conditions, submit your pictures. Post pictures and videos on Facebook, Twitter or Instagram with the hashtag: #wedontslum. Please add the area where you live (ie. “I live around 70th and Blondo.”) Pictures and videos will be posted anonymously and shared with our Mayor and City Council. Message on Facebook with pictures and videos and they will be shared on the website. 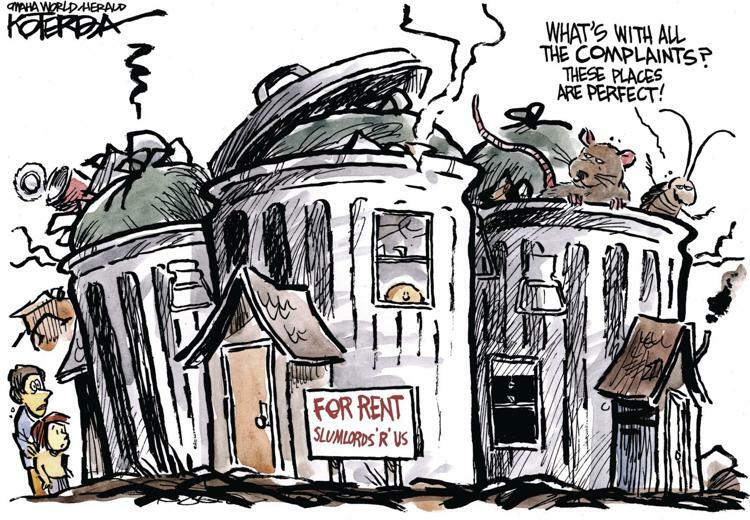 OTOC leader Dennis Walsh and Restoring Dignity Executive Director Hannah Wyble published an op-ed in the paper outlining what an effective housing policy should have to prevent the furthering of substandard rental housing. Call your council member today! The City of Omaha is currently drafting a City ordinance to head off action by the Unicameral on Sen Wayne’s LB 85 which requires the City to register and periodically inspect all rental property in Omaha. Tell Mayor Stothert and your City Council member you want a strong ordinance requiring both Registration and Proactive Inspection. See below what OTOC believes the city needs to adopt. 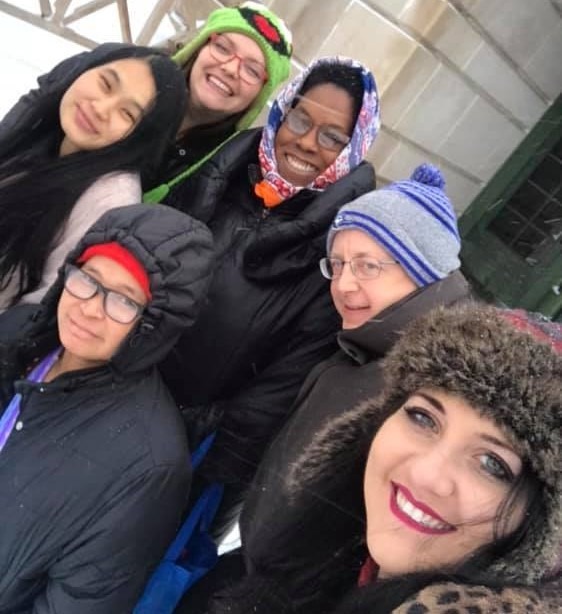 OTOC leaders attended the Jan. 29 City Council Meeting where the city decided to postpone their vote for TIF funding for local landlord who has substandard properties. In another unprecedented decision, the Council found that they are able to take in account a property owner’s other properties when approving TIF dollars for new projects. The council voted 4-3 to give Dave Paladino time to improve his current code violations and show he is making strides to improve all of his properties. OTOC appleauds City Council for taking a good first step towards recognizing the need for better housing code enforcement so that rental properties do not reach the level of deterioration of Yale Park and Dave Paladino’s properties brought to light in the Jan 11 TIF hearing at City Council (see below for more details). We need to continue to reverse a decades long deterioration of affordable housing and rental property in Omaha. 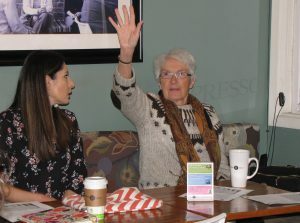 “City Council sent a message to developers and property owners they have to maintain their existing rental properties before coming to the city seeking tax payer funded handouts for new development,” said OTOC Housing Team leader Susan Kuhlman. 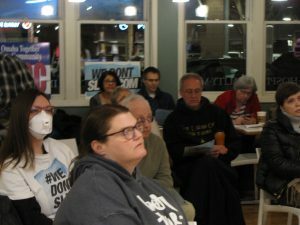 “Now the City Council and Mayor must adopt an ordinance which prevents the deplorable conditions existing in way too many rental units” said Kuhlman. On Tuesday, the Urban Affairs Committee of the Nebraska Unicameral heard citizen testimonies on LB 85, which would require Omaha and Lincoln to develop a Rental Property Registration and Inspection Ordinance to ensure minimum health and safety standards are met in all rental properties. 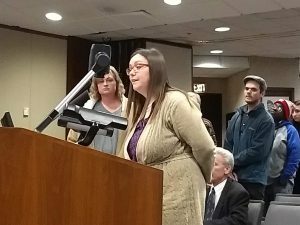 OTOC leaders testified in support of LB 85 along with tenants and other organizations like Restoring Dignity, Together, Family Housing Advisory Services, Omaha Healthy Kids Alliance, and others who submitted written testimony. WOWT, KETV, Omaha World Herald, Lincoln Journal Star and 1011 Now all provided news coverage of the hearing. OTOC Leader Dennis Walsh with Restoring Dignity staff and tenants who testified on Tuesday. We encourage everyone to continue to keep the pressure on legislators and the City of Omaha by taking the survey that was put out by Mayor Stothert. OTOC, working with 9 organizations active in housing in Omaha, has developed a a proposal for a rental property registration and inspection program that is funded by REGISTRATION FEES paid for by the Landlords. These fees would amount to an average of only $2.50 a month per unit to be paid by the landlord, not taxpayers. OTOC has found that 75% of current code violations and city funded demolitions since 2015 are in rental properties. 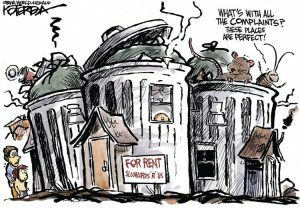 The City is already forced to spend significant tax payer dollars to condemn and demolish rental housing that landlords let deteriorate and then abandon. OTOC wants the City to shift to pro-active inspection to reduce the deterioration of rental properties and to maintain the stock of affordable housing in older neighborhoods. Click below to see the proposal that OTOC has provided to the City of Omaha. 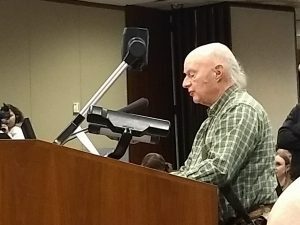 OTOC helped organize testimony surrounding Tax Increment Financing for Omaha landlord, Dave Paladino. Paladino Development Groups has thousands of low-income units that rent to a wide range of tenants, including many refugees. 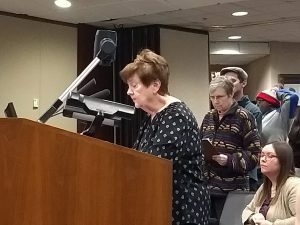 In the unprecedented hearing, diverse testimonies from tenants, Omaha Tenants United, concerned citizens, and a variety of agencies shared stories of Paladino’s treatment of tenants and business practices, lack of maintenance and upkeep, and unsafe and unsanitary conditions. TIF cases tend to be automatically approved, but the city council, who listened for over an hour and a half to emotional, moving testimony, voted to postpone to vote for three weeks. They want to look into TIF approval laws, which currently do not allow decisions to be made based on the applicant’s other business practices. Click hear for complete Omaha World Herald coverage of the TIF hearing. OTOC testified neutrally (read Gloria Austerberry’s testimony here), saying that Paladino does have a bad reputation among tenants, but works well with housing agencies that have case workers to hold him accountable. He meets the standards that are enforced, but when there is no enforcement, he gets away with neglecting properties and using a business model that seems to exploit tenants (read Hannah Wyble of Restoring Dignity’s testimony at the hearing for examples), proving again that proactive inspections of units will keep properties up to code when landlords don’t do it themselves. Several testifiers called for inspections on all of Paladino’s properties if he is to qualify for tax dollars on his new development project, and guarantees that rent will remain at market rate (read testimony by Jack Dunn from Policy Research Innovation and Rosalyn Volkmer). OTOC continues to call the City of Omaha to adopt a rental registration AND inspection ordinance so that all rental properties are routinely inspected. The testimony at this hearing showed city council and city staff that Yale Park is not the only substandard property in Omaha. Council member Pete Festersen said in his remarks that the City Council Planning Committee, which has been meeting regularly since Yale Park last September is getting ready to release it’s recommendation on what the city can do to address substandard rental housing. It is clear the tides are turning in the city, and that there is growing attention to substandard rentals and city code enforcement. The question is, when the committee’s plan is released, will it prevent another Yale Park? 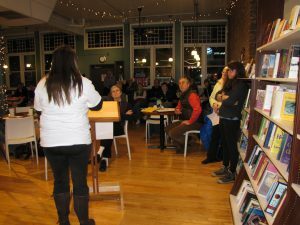 OTOC Leader Rosie Volkmer speaks from her personal experiences helping a refugee family. It has taken months since the family moved in after Yale Park for maintenance issues to be fixed. Jack Dunn of PRI calls for rent protection for the TIF properties and an inspection system, as Paladino Development Group’s track record shows that the current compaint system is not working. 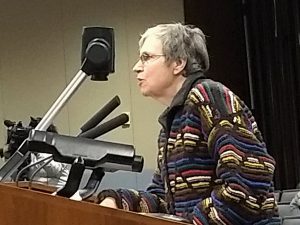 Hannah Wyble from Restoring Dignity offers data of issues in Paladino’s apartments, and a call for more inspections and compliance in his current units before he is eligable for TIF money.